Oh, man! Are your students fans of the Magic Tree House series? If so, they’ll be eager to get their hands on these newest books! The Survival Guide, complete with a compass embedded in the cover, shows readers how they can tackle lots of scary situations, just like Jack and Annie! Fact Tracker: Ninjas and Samurai is the nonfiction companion to Night of the Ninjas that helps answer questions Jack and Annie have after that adventure. Then check out the new edition of Mummies in the Morning! It has full-color illustrations, a new letter from the author, and pages with mummy and pyramid facts from the companion Fact Tracker. Need some more help leading students to books they’ll want to read? Get a free poster that guides reluctant middle-grade readers to new favorite books. No matter what students prefer to do—whether it’s watching movies, playing video games, watching television, or going on adventures—this poster can help them find a book that will keep their attention and motivate them to read. Click here to request your poster. Hurry! Supplies are limited! Get ready for some books that aren’t your everyday animal stories. 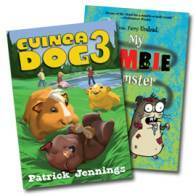 My Zombie Hamster is perfect for grades 3–7 readers who like humor, animals, and chills! Matt gets a fluffy little fur-ball of a hamster, named Snuffles nonetheless, as a gift. He’s not thrilled; he wanted a new video game. But then Snuffles dies and rises up as the undead. Say hello to Anti-Snuffles—or better yet, run! Guinea Dog 3, the newest book in the series where guinea pigs behave like other animals, features a guinea pig that swims like an otter—an unusual pet for a shy boy who’s afraid of the water! Click here to read sample chapters from both books. Here’s a perfect fall project that results in a book every student will want to read! 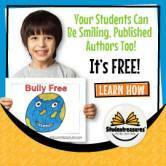 Get a free hardbound book—written and illustrated by your students—from Studentreasures. Just order a free publishing kit and fill the pages with students’ writing and illustrations; then return the completed kit for publishing—you don’t even pay the postage! Plus publish through December and be automatically entered to win a school grant. The Common Core–aligned publishing project is a great way to spark students’ imaginations and motivate them to write. Learn more at TheMailbox.com/classbook. Need more writing inspiration? The Writing Thief: Using Mentor Texts to Teach the Craft of Writing has more than 90 mentor texts and straight-forward activities that incorporate the traits of writing across the informational, narrative, and argument modes. Writing thieves read widely, dive deeply into texts, and use great texts as models for their own writing. Click here to learn more! Don’t forget, submit a comment now for your chance to win the Magic Tree House books! PS: There’s still time to submit a comment to “Catch a Space Taxi to a Galactic Giveaway of 200 Books!” to get your FREE copy of Space Taxi: Water Planet Rescue. Two hundred—yes, that’s 2-0-0!—of these books will be given away! Make sure you include your full name and address plus the name and location of your school. This information will not be posted with your comment nor will it be saved. Click here now! My students love the Magic Tree House chapter books and Research Gudies. My favorite is the Writing Thief. I can always use extra ideas for enhancing writing skills ! I am teaching Magic Tree House books after school, so the Survival Guide would be great to use with the class. I read many of the Magic Tree House books with my students and the Research Guides are awesome reference materials! I have taught many students how to do research and paraphrase information in their own words when writing a paper from using the Research Guides. I am also very intrigued by the Writing Thief. I can see where it would be so useful in the classroom. I actually had a professor in college practice that with one of my literature courses. While analyzing the work of a writer, the teacher would bring in and read reviews, other author’s thoughts about the work, and other things and then have us write our thoughts based on those formats. I would love to break that down and use it with younger students. I’m very interested in The Writing Thief – using mentor texts. Sounds like a wonderfully creative way to teach/enhance writing. The writing thief looks like a very good resource. My Pre-Kindergarten class loves to make their own books, so the Free Publishing Kit is fantastic! I like The Writing Thief: Using Mentor Texts to Teach the Craft of Writing. Everyone cab use some wonderful examples of great writing in different genres. My Zombie Hamster books look interesting. Studenttreasures is a great way to get students involved in writing. I love the whole Magic Tree House series. Student Treasures is a great way to get students writing. Anything that helps with writing is good in my book. The Writing Thief looks like a winner.